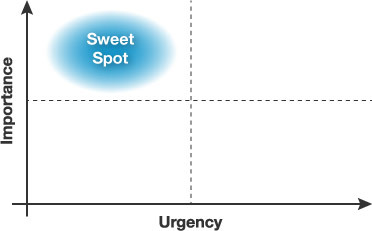 Maybe I’m misreading your, but I believe the sweet spot should be high-importance, low-urgency. That’s where you can work on things that are important before they become urgent. I think you need to be careful with deadlines; people like to throw that term around. I like to reserve the word “deadline” for something that has serious consequences if missed, and use “target date” when we’re aiming for a date, but nothing critical happens if we miss it. I suppose it’s just another way of prioritizing what truly needs to happen. You make a great point about peak creative hours. As I spend more time freelancing, and have more control over my schedule, I’m astounded at how productive I can be when I choose when to perform certain tasks. Wow, good catch – I created that graphic quickly, and put the words on the wrong axes. It is corrected now, and you are right: high-importance, low-urgency is what I meant.